Italy was declared European Women's Volleyball Champion (U-19), the finals are held at the Feti Borova Sports Hall at the Olympic Park in Tirana, Albania. This was the end of a championship full of emotions, joy, tears, passion, grind and determination. The Albanian Volleyball Federation expresses the pride that they could successfully accomplish, for the first time in Albania, an event of such magnitude as the European Women's Volleyball Finals (U19). We thank the CEV that gave us the trust and support, as well as the staff of the FSHV of every person who contributed and helped in organizing this magnificent championship. 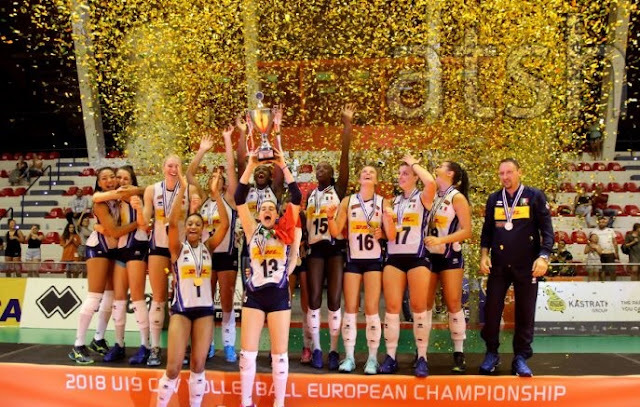 Congratulations to Italy who was crowned champion of # EuroVolley19 after a battle with 5 sets against Russia, creating a fiery atmosphere for the team and spectators.